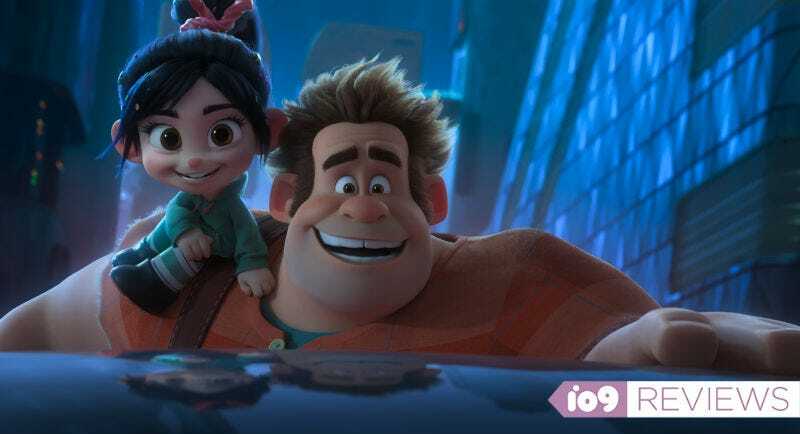 Ralph and Vanellope are back in Ralph Breaks the Internet. Ralph Breaks the Internet is an insanely ambitious movie. It is jam-packed with fascinating ideas and important themes to go along with all the humor, heart, and excitement one would expect from a Disney Animation film. For the most part, that ambition adds to the film, providing it with memorable scenes, emotional heft, and timeliness. Other times, though, it can hold it back a bit—if only because balancing and weaving all those pieces together can feel a little forced. Ralph and Vanellope travel to through the arcade’s wifi, but this isn’t just some normal internet. This is a fully realized embodiment of the internet, a place where users are represented in the form of little avatars, websites are giant buildings, search engines are adorable creatures, pop-up ads are street performers, and a pair of video game characters can try to save an old arcade game by finding a rare item. Once Ralph and Vanellope arrive in the internet and dig deeper and deeper into the landscape, they begin to question their own lives and how happy they actually are in them.